Life has been so uneventful and joyless without Prince Harry news. But fret not, this is sure to reawaken your will to live and be a balsam to those tired eyes…. 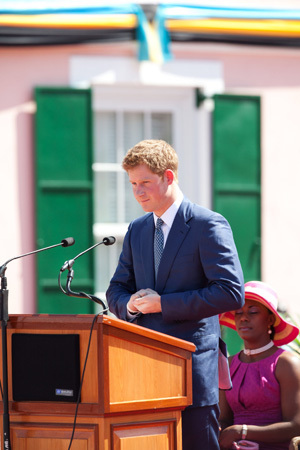 Prince Harry has been keeping busy, galloping through the Caribbean on a mission to honour Queen Elizabeth’s Diamond Jubilee. He has partied it up in the Bahamas, Belize and Jamaica; and this past weekend, this boy took his royal self to Brazil. And man, oh, man, the fun he’s had… certainly makes us jealous, sitting up here in sub-zero temperatures. He kicked off the tour in a true royal fashion — by completing a Sport Relief mile in Rio de Janeiro. And, of course, he had to brighten the seriousness of his deed by sporting a cut-out mask of Prince William’s face during the charity race. He ain’t dubbed “the fun-loving royal” for nuttin’. There it is, it’s all fun and games.… What if Prince William’s confidence in his dancing skills just plummeted? What if he never dances again? Who wants to live in a world where horrible, disorderly rhythmic movements are forbidden or discouraged?! Harry also played at a charitable polo game, which his team won 6-3, no big deal. And he received a smooch from Brazilian swimwear model Fernanda Motta — not too shabby, sir! “I tell you what, it’s been an emotional trip. I’m absolutely exhausted, but the warmth of the reception that we’ve received from every single country that we’ve been to has been amazing. Aye-aye. Well said, and Godspeed!